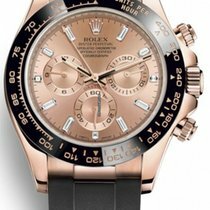 Pre-owned Rolex Daytona Cosmograph Steel & 18ct Yellow Gold 116523 (Rolex serviced 2018). 40mm Stainless steel case. Black dial with gold tone hands and hour markers. Minute markers around the outer rim. Luminescent hands and dial markers. Three Gold outlined Chronograph sub-dials displaying: 60 second, 30 minute and 12 hour. Fixed 18ct yellow gold bezel. Automatic movement. Scratch resistant sapphire crystal. Screw down crown. Solid case back. Stainless steel and 18ct yellow gold oyster bracelet with a Deployment clasp. Water resistant at 100 meters / 330 feet. Service box and Rolex Warranty card dated October 2012. This watch has recently been back to Rolex’s U.K service centre where it underwent a full service to its movement as well as a full refurbishment to both case and bracelet. Replacement crown was also fitted. The watch is complete with its service invoice(£743) and 2 year service warranty dated November 2018. Although Rolex have valeted this watch to a very high standard there are still some very light scratches to the bezel that may not be easily visible in the pictures. The pictures you see are pictures of the actual watch (with exception of the front cover shot)!! We sell only what we have IN STOCK!